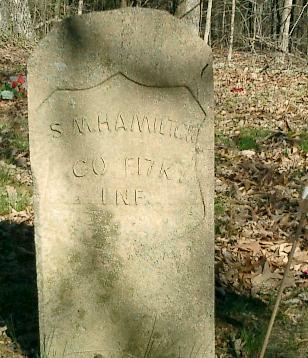 Samuel Hamilton enrolled in the 17th Infantry on October 25, 1861. He was mustered in on January 4, 1862 at Calhoun for a three year enlistment in Company F. He was mustered out with his unit on January 23rd 1865. He was absent without leave from February 22d, 1862 to September 15th 1862; restored to duty with loss of all pay and allowances while absent. There are no other comments in the AG Report.